During the month of December, San Diego hosts not one but two bowl games at Qualcomm Stadium. While the bowl games will play out on the Jack Murphy Field, there will be plenty of family friendly and free events leading up to each game. Who will be this year’s Poinsettia Bowl champions? Since 2005, the Poinsettia Bowl has pitted a Mountain West Conference team against various opponents including Army, Navy and teams from the Pac-10 Conference. This year, the hometown San Diego State University (SDSU) Aztecs will take on the Brigham Young University (BYU) Cougars at Qualcomm Stadium. 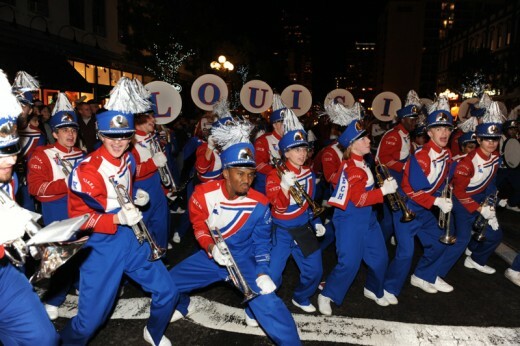 Two days before kick off (December 18, 2012) at 6:00 PM, head down to the Gaslamp Quarter for the Poinsettia Bowl Gaslamp March. Marching bands and spirit squads from SDSU and BYU will march down 5th Avenue from opposite ends playing holiday classics. When both squads meet up at market, the showdown begins with a Battle of the Bands. After the battle is over, the bands will continue their marches down 5th. For 34 years, the Holiday Bowl has brought top ranking teams from conferences including the PAC-10 and Big 12 conferences to San Diego. This year the University of California, Los Angeles Bruins will play against the Baylor University Bears for the coveted Holiday Bowl trophy. 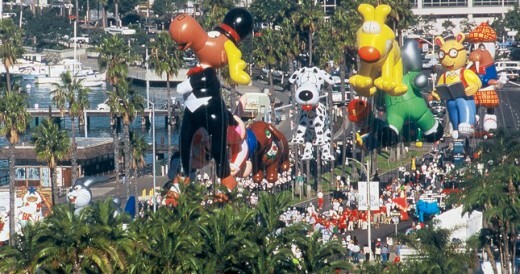 Before heading to the Holiday Bowl in the afternoon, spend the morning along the Embarcadero for America’s largest balloon parade starting at 10:00 AM. In addition to the parade, the festivities include the 16th annual Wienerschnitzel Wiener Nationals, 17th Annual Bumble Bee Foods 5K Run/Walk and a free Family Festival. Looking to fuel up with some delicious food before heading to one of the bowl games? Here are a few good options close to Qualcomm Stadium you should check out. If you plan on driving to Qualcomm Stadium, give yourself plenty of time to snag a parking spot. Cars are $20 and RVs are $60. VIP parking for $60 is limited, so call 619.283.5808 to purchase. There will also be overflow parking options. This is your best option for getting to Qualcomm Stadium without having to worry about parking. Just pick up a special day pass at a trolley station and take the Green Line to the stadium. There will be a special events trolley that runs from Downtown to the stadium. If you are coming from North County, take the Coaster to the Old Town Trolley Station and hop on the Green Line from there. Get times and trolley station locations at www.sdmts.com.